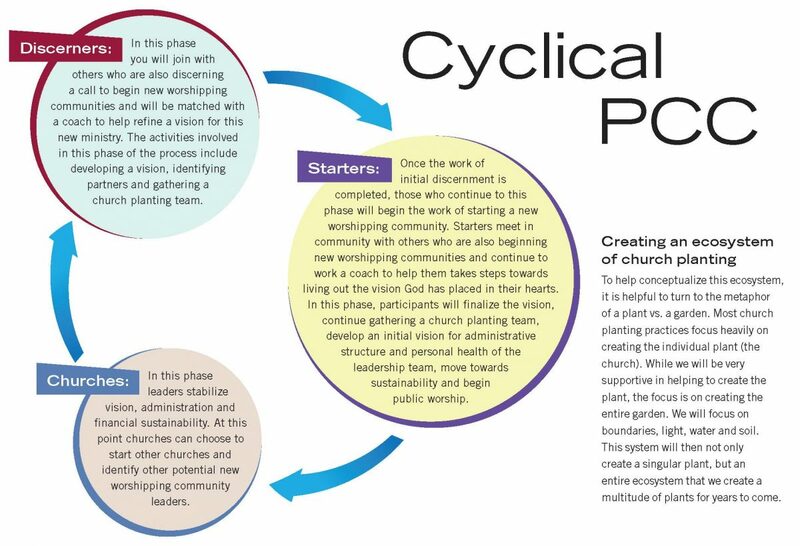 Cyclical PCC is a church-planting support initiative within The Presbyterian Church in Canada, in partnership with Cyclical Inc. It is designed to encourage presbyteries and leaders within our denomination take first steps towards beginning new worshipping communities. By participating in this program you will be led through a three-step process of discerning call and vision, taking initial steps towards living out the vision and establishing a sustainable new ministry. Participants in this initiative will take part in an assessment to help them discern gifting in the area of church planting. Participants will receive training designed to equip leaders for the challenges of starting new worshipping communities. Participants will also be connected with other leaders from across the PCC who are also beginning their journey towards starting a new worshipping community. What is a new worshipping community? New Worshipping Communities are innovative and creative expressions of ministry that are responsive to the work of the Holy Spirit. These ministries take many forms: dinner churches, sports ministries, house churches, traditional church plants, café ministries, really any kind of gathering centered on Word and Sacrament that reaches new disciples and calls people to walk closely with Jesus. Communicate your interest by filling in the basic information form linked below. Once your form has been received, you will be contacted by the Cyclical PCC Coordinator to discuss possible next steps. The Life and Mission Agency is very pleased to announce that the Rev. Matthew Brough will be joining the Canadian Ministries department in the role of Program Coordinator for the New Worshipping Communities Initiative (Cyclical PCC). This is a part-time contract position and Matthew will be working from a home office in Winnipeg, MB. Matthew has served for twelve years as the minister at Prairie Presbyterian Church in Winnipeg. Matthew has been involved in the PCC’s new church development coaching network for the last number of years. He is always on the lookout for new ways of engaging in ministry and is passionate about ministry models that encourage congregations in their own context, especially in small church settings. He is the author of several fiction and non-fiction books and hosts a podcast called “Spirituality for Ordinary People.” Matthew will continue to serve as minister of Prairie Presbyterian Church on a part-time basis and we are very grateful to the Prairie PC community for their willingness to facilitate this shared ministry arrangement. This is an exciting new project and we are very fortunate to have Matthew’s leadership and the close working relationship with Prairie Presbyterian Church. If you have any questions about the Cyclical PCC program, please contact Jen de Combe, Associate Secretary, Canadian Ministries.